Have I mentioned that Mom kept everything? Well, she did. I came across this today while attempting to organize my attic office. After Tuesday’s election, I’d not mind Reagan as president again. I don’t know why Mom had this and I don’t know what the occasion was but I probably sent it in a letter (remember letters?) to my dad who was a Republican and voted for Reagan. 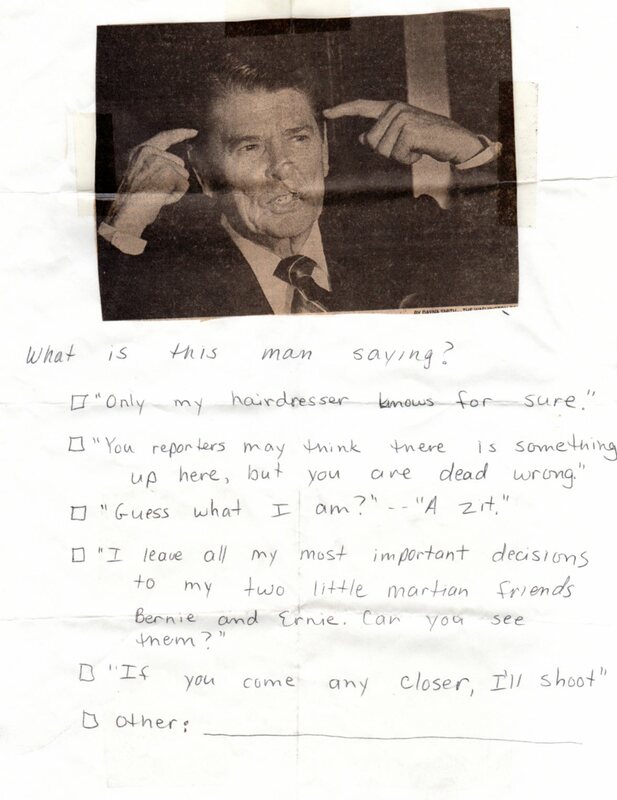 If you have trouble seeing the image, here’s a text alternative: Photo of Ronald Reagan pointing at his head with his two index fingers. Text: “What is this man saying?” 1. Only my hairdresser knows for sure 2. You reporters may think there is something up here but you are dead wrong. 3. Guess what I am! … A zit! 4. I leave all my most important decisions to my two little Martian friends Bernie and Ernie. Can you see them? 5. If you come any closer, I’ll shoot. 6. Other___________.